Although Pique has confirmed that he loves barça and wants to stay, it is difficult for his team, FC Barcelona, to ignore such amounts of money that Chelsea, Manchester United and City are offering to tempt Pique to change from the BBVA to the BPL. Pique has recently not had his best matches for Barcelona and this has made the rumours be more consistent. Most of the barcelona fans would be happy to see Pique go to another club, especially when they see how much money is being offered for him. It is normal for Chelsea to be a great candidate, because it is the team which most money offers (30 millions of euros), and also the team which has one of Pique’s best friends – Cesc Fabregas. Although, it is very difficult to argue that Pique will play for Chelsea’s Jose Mourinho – one of his enemies when he trained Real Madrid. Another great candidate is Manchester United, Pique’s favourite team in the BPL and his team before he went to FC Barcelona. His past as a red could be decisive and make him go to Manchester United, BUT, it is the team which less money offers, 25 millions of euros, and it will be difficult for barça to give him away for that amount. The other team is less probable to be the host of Gerard Pique’s transfer, and it is Manchester City. 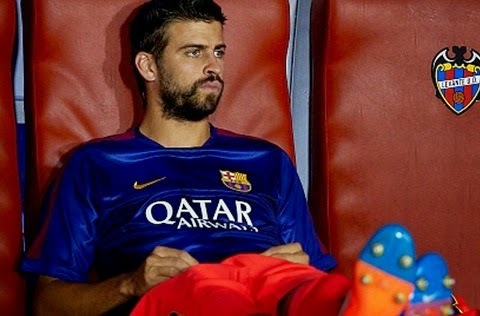 Although they offer a good amount of money, 28 millions of euros, they do not have a connection with Pique and barcelona would choose Chelsea before Man City because of the difference in the amounts of money. It was a great game, the whole our department watch it.